It sounds the stuff of nightmares, but more and more patients are outlasting their teeth. 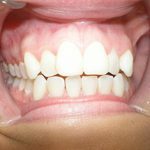 Increasingly patients are needing extractions of teeth not due to neglect (although this does still happen) but simply because fillings, crowns or root filled teeth are wearing out under the demands of our busy lifestyles and leaving us with the question none of us want to be presented with – how do I replace a tooth that can’t be fixed? The solution is in the form of dental implants. Dental implants are a precision restoration that replaces the roots of a missing tooth or teeth in order to act as a stable secure support for various types of restorations, dependant on the wants and needs of our patients. These restorations include single crowns, small bridges replacing 2 teeth, larger bridges replacing more than 2 teeth and potentially replacing a full set of teeth. Implants can even be used to secure dentures that are otherwise unwearable due to lack of remaining gum height. 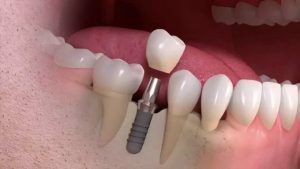 What is involved in placing a dental implant? 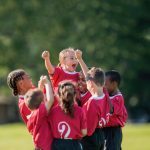 Each patient we see is different and, as such, there is no one-size-fits-all plan. We treat each patient as an individual and assess each case with the care attention we would expect if receiving treatment ourselves. The first step is a free initial consultation for our implantologist to discuss with you your wants and needs and to check it is feasible to place an implant before you are charged for any further planning. If you decide you wish to proceed with planning we arrange a succession of appointments in order to meticulously plan the proposed treatment, allowing you to be able to see how you will look at the end of your treatment and for us to assess every aspect of the plan, from where best to place the implants to when we will be able to fit your final restoration to make sure you aren’t wearing your denture on holiday or in your wedding photographs. At Dental Excellence we firmly follow the philosophy of restoration driven planning, where we place our implants so as best to support and retain your restorations rather than placing the implant where there is bone available and figure out where the teeth would go later. This may seem a strange statement to make but we are seeing increasing numbers of patients who have had implants placed but are less than happy with the finished outcome purely because the implant is simply in the wrong place to support the restoration. We achieve our philosophy by using state of the art CT scanning, placing our implants using computer generated guides and working with the best technicians available to ensure the best possible results for our patients. Why does the price of dental implants vary so much? Simply put – you get what you pay for, as with most things in life. 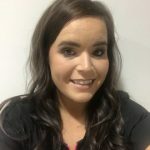 Believe it or not, it is possible to purchase implants from ebay for around €25 and it is possible for a dentist to train to place implants in a weekend. There is extensive research in dental circles as to how long dental implants last so we can properly advise you, our patients. The figures show us that dental implants are incredibly successful – rates of 95-98% are the current accepted figure. However, these success rates can vary. Causes of this variation are associated mainly with the general health and lifestyle of the patient and the available bone in which to place the implants in. There is also a factor relating to how the surgery is performed and what type of implant is used. As you would expect, cheaper implants and less experienced surgeons have a higher failure rate. At Dental Excellence we exclusively use Straumann implants – a premium implant brand renowned for their extensive research into perfecting the design and manufacture of their implants. Our implant team is led by Dr David Gwyer. David has been involved in implant surgery since graduating from university in 2009 and is currently reading for a Masters degree in implantology through the university of Bristol. David has helped countless patients to restore their smiles and regularly attends training courses in addition to his university studies to ensure he is at the cutting edge of dental implantology. There are very few patients to which we say, “We cannot provide implants for you”. 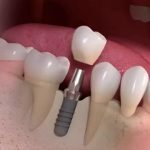 Recent advances in implant technology mean that more and more patients are now able to have implants to restore their smile. Age is no barrier – as long as we can see your mouth is in a stable healthy condition or that it is possible to correct or treat any dental issues there is a strong likelihood, we will be able to help you. Aren’t we all? 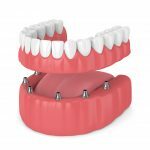 You will be glad to know that placing a dental implant is often no more uncomfortable or invasive than having everyday dental restorative work or a simple extraction. Naturally we will provide you with appropriate medication should you need it, but our experience is that most patients don’t take any pain relief at all. If you are in any way anxious about any part of your treatment don’t let this be a barrier to you. We have the facility to offer sedation or ‘twilight sleep’ for any and all procedures that we provide at Dental Excellence. With the addition of sedation you can have your treatment carried out in a relaxed, calm way – most patients simply drift off to sleep and wake up when the treatment is complete. Sounds good. I’m worried about whether I can afford the treatment. No matter how appealing we make dental implants sound the simple fact is that it is a more expensive treatment option than others available. We can advise with absolute confidence that you will feel you have received complete value for money. Dental implants far out perform other treatment options for missing teeth, both in longevity and improvements to quality of life. To give you an idea of what we mean below you will find the normal costs and likely lifespan of the main treatment options for restoring a space left by a single missing tooth.